Spring is now well underway .The Chiffchaffs are here and loudly singing their distinctive song. If you don't know what a chiffchaff sounds like the clue is in the name! 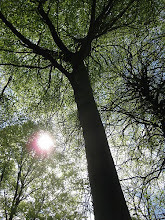 The woodland flora is contiuing its frantic rush to flower before the summer canopy of leaves blocks out the sun. Wood anemones are in flower and the leaves of the bluebells and wood garlic which will follow are pushing up. It is my favourite time in the woods as before the leaf cover is established you can observe the birds as see the more distant views more clearly. Each season has its own features and I love to walk the woods all year and feel very fortunate to live in the Cotswolds.